Kangxi celadon fleuri vase with Règence ormolu mounts. Kangxi (1662-1722) celadon fleuri vase in finely chased Règence ormoulu mounts. 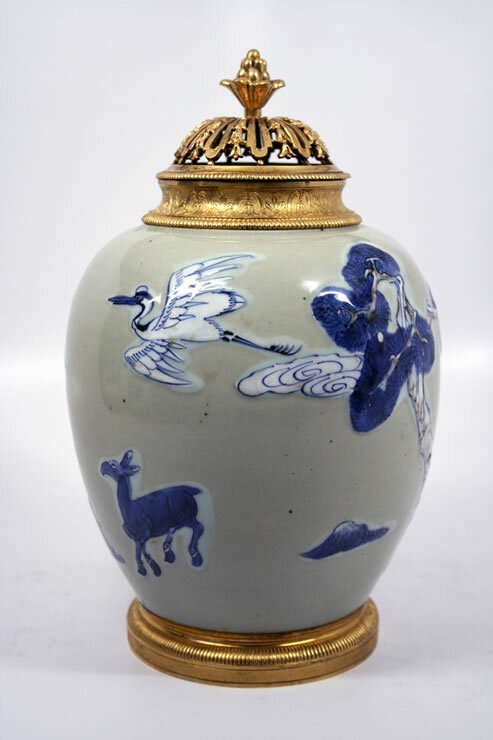 The green ground vase depicts a continuous landscape with two large trees, flying cranes, and a doe and a buck in under glaze blue with some brown washes. The vase is marked on the bottom with the “double ring” mark of the Kangxi period.